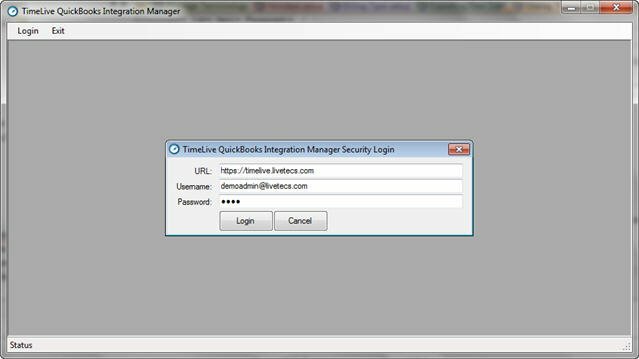 [TimeLive QuickBoooks Integration Manager] provides users the ability to transfer information between TimeLive and QuickBooks. With the ability to transfer time and expense data, the integration module is an ideal solution for those working on projects or tasks that are to be billed to clients. Using TimeLive, you can track the actual time spent working on projects, then transfer the data to QuickBooks, to invoice clients for the work completed. Time data entered by employees can also be transferred for use in generating payroll timesheets in QuickBooks. Plus, expenses incurred against the project can also be entered in TimeLive, and transferred to QuickBooks to reimburse employees, pay vendors and charge clients. Additionally, you can use the integration module to save the time and effort associated with entering the user and project data in both QuickBooks and TimeLive. This duplication can be eliminated by entering the data in one application and transferring to the other using the [TimeLive QuickBooks Integration Manager]. Configuring QuickBooks for use with the Module. Your machine meets the integration module’s minimum system requirements. You are installing the integration module on the computer where QuickBooks is installed. Your version of QuickBooks is updated to include all available patches (recommended). Before attempting to integrate with TimeLive, follow the steps below to ensure QuickBooks is properly configured for integration. When you integrate with TimeLive, you will transfer data to and from the open QuickBooks company file. If a dialog box displays indicating that TimeLive is attempting to access the QuickBooks company file without a certificate: a. Select the [Yes], [Always] button. This will allows TimeLive to access the company file for data transfer purposes. Selecting [TimeLive QuickBooks Integration Manager] from the Windows Start menu. On login window, enter [TimeLive URL] which you are using to access your TimeLive application, TimeLive username and password. Click on [Login] button to launch Integration tool. When a QuickBooks dialog box stating the module is attempting to access the company file displays, enable the check box labeled [Allow] this application to access. This will give TimeLive permission to transfer employee and vendor data to the company file. Select the [Yes] or [Always]. Select [Yes] if asked to confirm. The main [TimeLive Integration Manager for QuickBooks] window displays. After login, application will show TimeLive integration main options screen as below.